Non-alcoholic liver disease (NAFLD) is considered the hepatic manifestation of metabolic syndrome and is the primary cause of chronic liver disease in industrialized nations. NAFLD represents a wide spectrum of liver pathology and ranges from benign, fatty liver or steatosis to non-alcoholic steatohepatitis (NASH), which is the cause of liver fibrosis. Progressive liver fibrosis is associated with increased risk of cirrhosis and hepatocellular carcinoma (HCC). The gold standard for establishing a NAFLD diagnosis is a liver biopsy, which is also used to monitor the progression of liver fibrosis. However, liver biopsy is an invasive and costly procedure subject to sampling errors and inaccuracy due to inter- and intra-observations of pathologic interpretations. 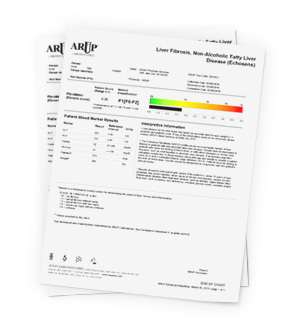 The FibroMeter NAFLD test is a non-invasive alternative to liver biopsy and serves as a surrogate marker of liver fibrosis specifically in patients with chronic liver disease due to NAFLD. A proprietary algorithm calculates results based on patient clinical data (age and weight) and five blood biomarkers: platelet count, AST, ALT, ferritin, and glucose. A patient score (0–1) and correlated fibrosis Metavir stage (F0–F4) are provided. Fibrosis stage has been shown to be the strongest predictor of mortality associated with NAFLD.